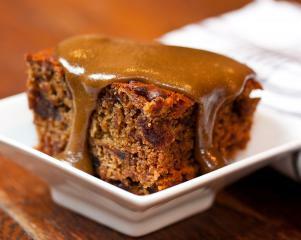 Sticky date pudding is a classic winter dessert served warm and smothered with toffee sauce. Pre-heat the oven to 190 C / 375 F.
Simmer the dates in a saucepan with the soy milk until soft (about 5 minutes). Take off the heat and add the bicarb (it will fizz up) and put aside. Cream together the margarine and sugar with a beater, then add the date mixture. Add the remaining dry ingredients in and mix in well. Spoon into a well greased 20cm x 20cm tin or pudding bowl. Bake in the preheated oven for 40 minutes or until cooked (it will take longer in a pudding bowl). When it is cooked the sponge bounces back when pressed lightly. To make the toffee sauce melt the golden syrup, margarine and sugar in a saucepan and simmer until all the sugar granules have disappeared.